– World War I – | The World of C.C. Been doing a lot of google on First World War, well a bit on the war itself – more on the literature and art during that period, if to be precise. 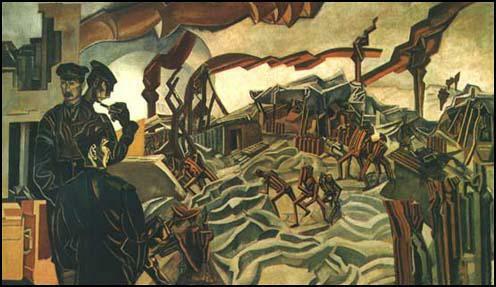 The whole literature and art caught my interest began with Wyndham Lewis, a war artist. I bumped into him in the bookshop when seeing a picture of him on a postcard, I googled the artist as I got home then the whole interest brought out. I did not know why the interest existed, yet I was certain it was something related to my novel “A Memoir of A Vampire”. I was thinking of a scene of Ladon Greene in First World War, he was running with his fellows to the Germans to fight, yet he felt his body and senses detached from him as his colleagues fell down one by one around him. That was the scene from the dream, that got me reading about First World War in the first place. Then I surprised myself by signing up two courses from FutureLearn (free online courses website) which related to First World War, one was from my Alma Mater University of Leeds on heroism and change of society, the other was from Open University on trauma and memories. Both are equally interesting in their own rights, which I hope to learn more about. Especially heroism, as the term reminded me of Japanese’s perspective on death. In war time their ideal of heroism was greatly associated with glory and honor, even in death they have to have the most heroic or the least shameful. Anyway, I shall report about the course and stuff later on.